A drink-driver crashed into a verge as he was on his way back from a festival. Daniel Alton, 21, lost control of a Ford Focus along the A5012 at Newhaven, between Matlock and Buxton, and was taken to hospital for a check-up, according to a Chesterfield magistrates’ court. Prosecuting solicitor Neil Hollett told the court hearing on August 23: “Police were called to a road traffic collision on the A5012 at New Haven after a Ford Focus had left the road and gone into a verge. Mr Hollett added that he was later taken to a police station where he recorded 55microgrammes of alcohol in 100millilitres of breath exceeding the legal limit of 35microgrammes. He told police he had been to a festival and had been drinking but thought he would be okay to drive but overshot a junction and crashed into a verge. Alton, of Stanton Road, Stapenhill, Burton-Upon-Trent, pleaded guilty to exceeding the alcohol drink-drive limit after the incident about midnight on August 8. Magistrates fined Alton £335 and banned him from driving for 15 months but he intends to take a drink-drive rehabilitation course to reduce the disqualification. 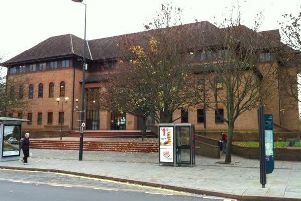 Alton was also ordered to pay £85 costs and a £34 victim surcharge.